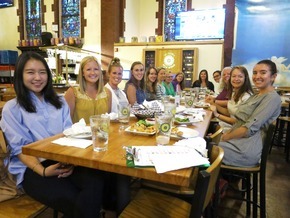 ​Welcome to the SWE Pittsburgh Section Website! ​​Check out our Job Postings Page for three new job listings! We are an active, widely dispersed section, with a membership base that spans across Pittsburgh and into many of the surrounding areas. We provide support for women in the science, technology, engineering, and mathematics fields at all stages in their careers - from K-12 exploration of potential careers to retired engineers looking to maintain ties and pass on their experience, and everything in between. We are planning exciting events this year. Check out the 'Events' page for more information. Check out our 'Job Postings' page for local job openings. This page is available to area companies to help put women engineers in contact with promising roles and to put companies in contact with high quality women engineers. Submit your job listings at swe.pittsburgh@gmail.com. Jobs are also posted in our monthly newsletter and through email blasts to our membership! Please note that SWE Pittsburgh does not award scholarships. SWE awards over 230 scholarships at the Society level. Please click here for more information. If you are interested in joining us, posting to our job board, volunteering, or requesting outreach and scholarship information, please use the contact form on our contacts page! Images contained on this webpage shall not be downloaded except for personal use. Republication, retransmission, reproduction or other use of the Licensed Material is prohibited.